If you don’t understand what this pick-up truck has to do with West Ham, check out my previous post on the Irons. One of the wonderful things about the football season is that, even more than most American sports (baseball is the possible exception), the only constant is change. This week’s challengers for Europe are next week’s relegation contenders. Even at the top of the table, form varies wildly and “crises” abound. So it’s not too surprising that, almost immediately after my initial post on West Ham, everything changed. What follows is a combination of my thoughts and the thoughts of others on those changes. First off, an injury to Joe Cole–who could have predicted that?–saw Big Sam going with exactly the line-up I’d suggested he’d avoid: Jarvis and Downing each on the flanks, an especially depressing prospect without Andy Carroll in place to fail to convert their crosses into goals. Oh, and lest you think it’s just me wingeing about those two, check out what Zonal Marking guru Michael Cox has to say about West Ham’s cross to bear. Cox’s article has broader interest for its analysis of an offense based primarily on crosses, but it’s particularly apropos given the underwhelming performances at Newcastle and against Stoke City. Fortunately, the development of Ravel Morrison combined with an injury to Downing to again rework things–but not exactly in the way I’d have expected. Rather than simply lining Morrison up as a replacement for Cole, an inward-tending winger to complement Jarvis’s genuine width on the opposite side (as was the case when he replaced Cole in the Stoke game), Allardyce has instead moved Diamé out to right wing, giving Morrison a position in the midfield proper. It’s a surprising move, and one I initially thought was selected specifically to combat the offensive threat of Luke Shaw down that flank, leaving Morrison more open to create. That may have been true, as each of the two following games had the similar potential threats down that flank (Leighton Baines for Everton and Robbie Brady for Hull City); but three games on, it may be that this is simply Allardyce’s preferred line-up at given his current available personnel. Jonny Mullins, in his EPL Index tactical analysis of the Southampton game which first featured this formation, noted that the formation shifted between 4-3-3, West Ham’s typical formation, and something that looked more like a 4-2-3-1, or 4-5-1 in Mullins’s assessment. 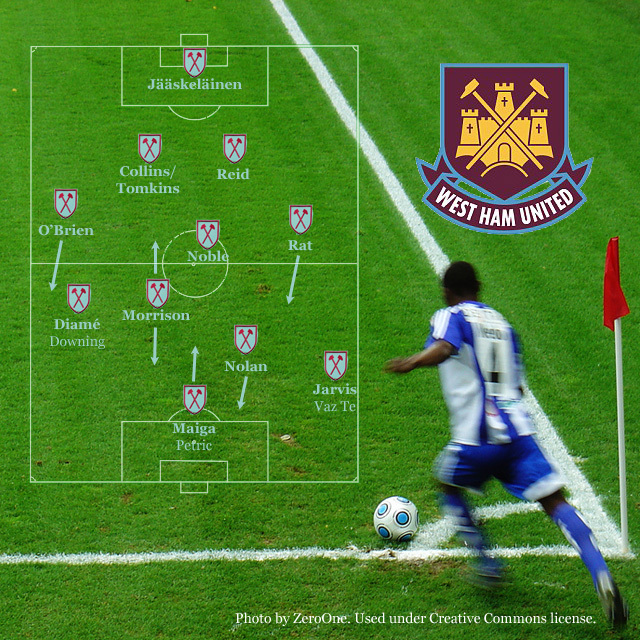 (He also, I would add, offered a sharp assessment of West Ham’s defensive strategy in the game.) In the Southampton game, I thought that Morrison began in a deeper position alongside Noble before gradually moving forward into something more like the aggressive positioning usually adopted by Diamé. But over two more games, it’s become clear that Morrison both adopts a deeper starting position and moves more vertically than Diamé, who tended to stay at least slightly ahead of Noble and moved toward the flank when not directly attacking the box. I’m still inclined to think of this in terms of 4-3-3, but Morrison’s shuttling role puts a very fine point on the distinction between these formations. Probably, the nature of the opponent will have as much to do with which description seems more apt, so with Spurs and Man City on the horizon, 4-5-1 may be the order of the day going forward. It would be hard to describe this new formation as a success given the results thus far, but it’s also difficult to judge how much of the blame rests on the shoulders Maiga, who has looked out of his depth in a starting role from the start. Then, too, there is simply the luck of the draw in a game of tight margins. Vinny Ryan wrote a very nice reflection for ESPNFC on the narrowness of margins in judging modern football clubs following the loss to Hull City. Morrison, though, has looked very promising thus far, and the season is still quite young. One final shout-out, unrelated to tactics, is a very thoughtful piece on the move to the Olympic Stadium and it’s impact on Leyton Orient by longtime West Ham blogger Billy Blagg. It’s a no-nonsense assessment that rings true on this side of the pond.